Today’s guest piece is by Nick Jones, AKA Louis XIV, who blogs about books (and sometimes comics) at Existential Ennui. You may be (should be!) familiar with him, because I’ve frequently linked both his book reviews and the great covers he digs up as he obsessively collects Stark and Westlake titles. 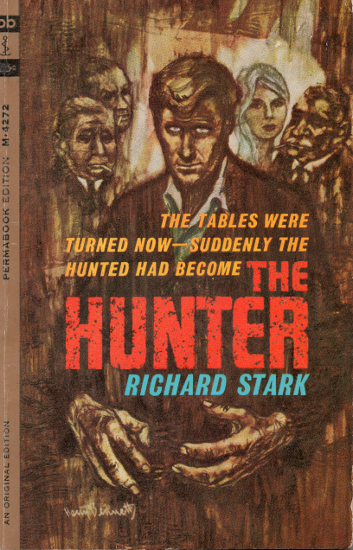 In fact, I’ve linked this piece already, but thought that a look at the original Parker cover artist, Harry Bennett, warranted more than just a link. Originally published at Existential Ennui, natch. 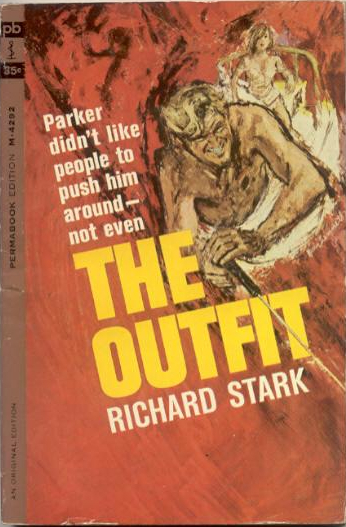 A couple of months back I wrote a post on artist Robert McGinnis and his portrayals of Donald ‘Richard Stark’ Westlake’s character Parker on the covers of the Parker novels published by Fawcett/Gold Medal (the four books from 1967’s The Rare Coin Score to 1969’s The Sour Lemon Score, plus a few reprints too). 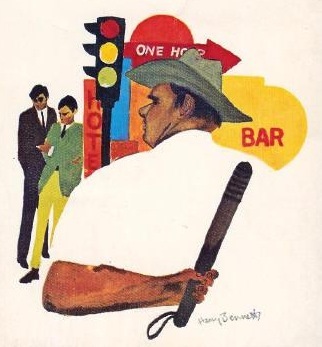 That’s still one of the most popular posts on Existential Ennui, but in my rush to identify the Perfect Parker I kind of skirted around the artist responsible for the lion’s share of the covers for the original run of paperback Parkers, i.e. the eight books published by Pocket Books from The Hunter (1962) to The Handle (1966). And that’s an injustice that needs righting, because the man in question, Harry Bennett, was, and continues to be, a brilliant artist in his own right. 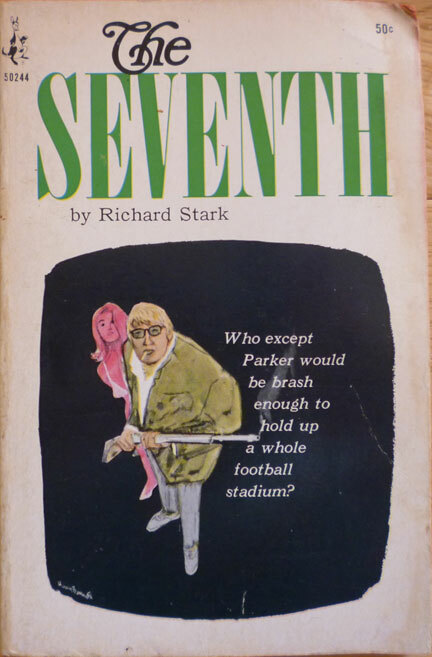 Bennett’s been on my mind because I recently nabbed a US paperback first printing of the 1966 seventh Parker novel – which, cunningly, Westlake named The Seventh, and not just because of its chronological significance – on eBay. Here in the UK, American printings of the Parker novels don’t turn up on eBay that often, so when they do, I’ll sometimes bid for them, even though I have at least one edition – mostly Allison & Busby editions – of every Parker novel anyway. (I could, of course, simply buy copies from booksellers in the States via AbeBooks, but where’s the fun in that?) To a Brit living thousands of miles away from America, who for the longest time dreamed of getting his hands on the exotic-seeming books and comic books and records that originated in that distant, unreachable country in those pre-internet years (even when, in my teens, UK bookshops, comic shops and record shops started importing US wares, there were still items that were legendarily elusive), there’s a tangible thrill in holding a copy of an original printing of a Richard Stark book. 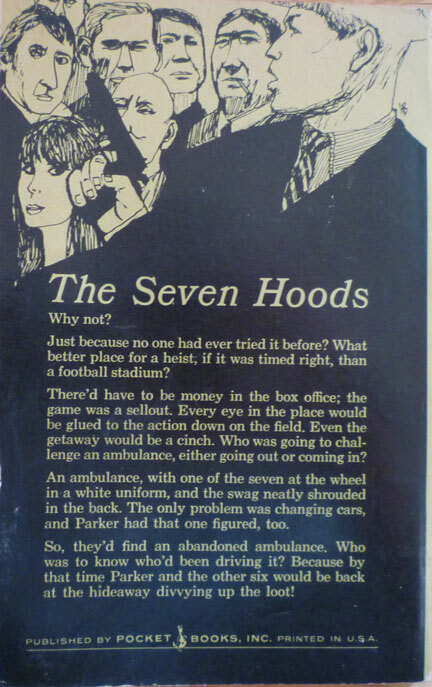 And owning a copy of The Seventh is a particular joy, because of the Parker novels I’ve read thus far (I’m on the fourteenth, 1971’s Slayground at the moment), The Seventh may well be my favourite. So, to kick off a week – or even a fortnight; we’ll see how things pan out – in which I’ll have a number of posts on various Donald E. Westlake paperbacks, let’s have a look at that copy of The Seventh, and the artist responsible for its cover. And the first thing to note is that, unlike most (all?) of the covers Harry Bennett drew and painted for those first eight Parker novels, on The Seventh we get two illustrations for the price of one. Because as well as that colour piece on the front cover – which I guess must be Bennett’s interpretation of the nameless thorn in Parker’s side, accompanied by the unfortunate Ellie – we also get an expressive line drawing on the back cover, depicting Parker and his six doomed cohorts from the football stadium score (plus Ellie again, presumably). I actually prefer this back cover drawing to the one on the front; there’s an almost European sensibility to the linework, as if the drawing could be a panel lifted from a bande dessinee. That casual distortion is a hallmark of a lot of Bennett’s work, although he did draw and paint book covers in a number of styles. One thing I mentioned in that McGinnis post was that Bennett’s depiction of Parker on his eight covers varies wildly. It’s hard to get a sense of how Bennett sees Parker; for example, on the back of The Seventh, presumably that’s Parker in the foreground, but it’s also the least characterful guy of the bunch. 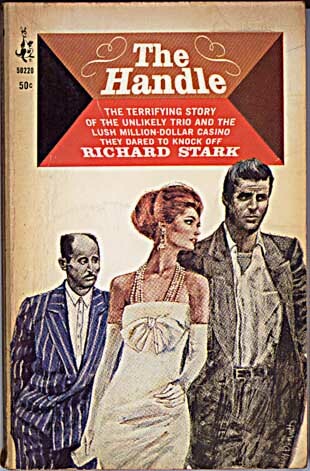 If we go right back to Bennett’s first Parker cover, for The Hunter, the only really distinctive thing about Parker there is the size of his hands (which Bennett surely got from Stark/Westlake’s memorable description of them near the start of the novel). And if we compare the Parker on The Hunter to the one on the back of The Seventh, well, those are two completely different people. 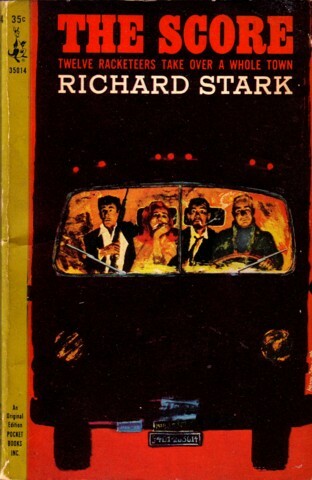 I guess you could make a case for the Parker on the covers of The Outfit (1963) and The Mourner (1964) being the same as the one on The Hunter, but I’ve got no idea which, if any, of the people sitting in the cab of the truck on the cover of The Score (1964) is Parker, and the incidental Parkers on The Jugger (1965) and The Handle are different guys again. 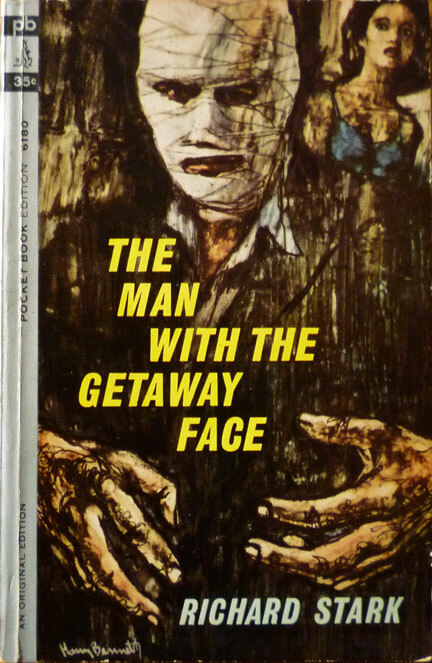 In fact I think of all Bennett’s Parker covers, the one that best captures Parker is the cover to The Man with the Getaway Face (1963), where all we can see of him are his huge hands and dark, steady, piercing eyes. 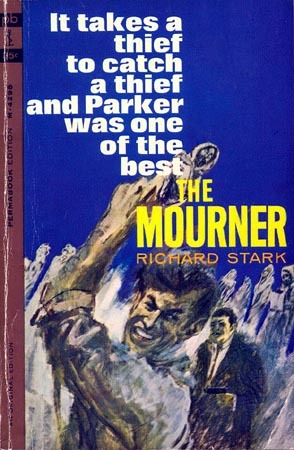 What that cover also does, though, is neatly illustrate the point that, at root, it doesn’t really matter how Bennett depicts Parker; these are still extraordinary book covers. Just look at that bird’s nest mess of ink and daubs of colour, at the thick black lines that call to mind Max Beckmann more than they do Bennett’s book cover contemporaries. Evidently, this is an artist who knows his art history. Born in South Salem in 1919, Bennett served as a major in the Pacific during World War II, painting the scenes he saw whilst fighting (he also suffered a broken back). He studied fine art at the Institute of Chicago and graphics at the American Academy of Art, and did advertising work for Pepsi and Buick before switching to book covers. But beyond his commercial career, Bennett was becoming an accomplished and respected painter. In 2008 the RiverSea Gallery in Astoria, Oregon held a restrospective exhibition of Bennett’s paintings, to act as a farewell to the local artist, who was moving to the east coast. Follow that link and you’ll find a few fine examples of his work, along with a profile which reveals that when Bennett arrived in Oregon in 1986 he experienced something of an artistic epiphany, over the next two decades painting hundreds of pictures of the people and places from the local area. Even before that, however, when Bennett was cranking out covers for gothic romances by Victoria Holt and Phyllis A. Whitney – probably the work he’s best known for – it was abundantly clear this was no run-of-the-mill cover hack. One need only regard the way the ghostly statuette figures on the cover of The Mourner grasp that bold blue background like fingers scrabbling for purchase, or how Bennett uses abstract blocks of primary colour as a shorthand for street signs on the cover of The Jugger. Clearly, this is a confident, clever artist. Fine art purists might dismiss Bennett’s covers as being merely illustrative, but that’s to ignore their formal qualities as pictures. The covers of The Man with the Getaway Face, The Jugger and The Handle stand as works of art, ones which could happily adorn any wall. 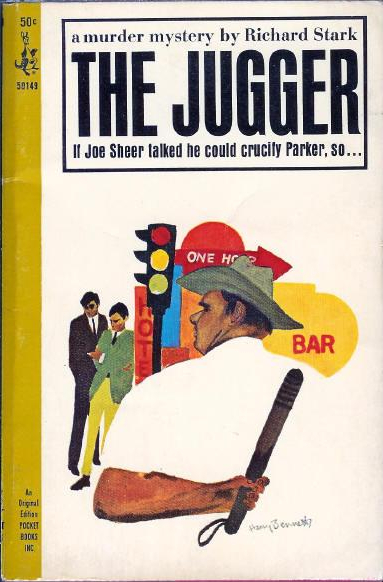 And even if one were to take them simply as illustrations, they still show a keen mind at work in the choices Bennett makes; that Jugger cover neatly summarises the small town setting of the novel, the urban paraphernalia offset by the good-ol’-boy sheriff. Where many covers, particularly in the crime fiction field, opt for quite literal interpretations of the particular material – a gumshoe, a moll – Bennett, though still figurative in approach, is quite happy to mix near-abstract elements with scenes lifted from the page. And Bennett is as good now as he ever was. His son, Tom, is also an accomplished artist, and often posts updates about Harry on his shared blog. And as these wonderful drawings show, Bennett’s art is still sharp and expressive. It’s nice to know that the man who lent his extraordinary talents to those early Parkers and helped define the look and feel of Parker’s world in many fans’ minds is still out there, doing his thing. Long may he continue. Members of Harry Bennett’s family left some comments on the original version of this piece. To read them you’ll just have to go over to Nick’s place and check out the original post. Bookmark the site while you’re there!